Today one of our contributors and community managers, Chesco Mom Steph from Confessions of a Stay-at-Home Mom, will be on 6ABC reviewing health and fitness gifts for the holidays! These gifts perfect for all the health-minded people in your life, and there are options for everyone! When these arrived, I wasn’t sure what to make of them. But I quickly fell in love and they haven’t left my feet. These neoprene socks are water-proof, germ-resistant and skid-proof. If you travel (hanging around in hotels or airports), these are perfect to pop into a bag so you can walk around in comfort. Also great for those who frequent the gym – wear them during yoga or slip them on after a swim as you walk to the locker room. Me? I wear them around the house. They keep off the chill, but so light I forget I’m wearing anything on my feet. 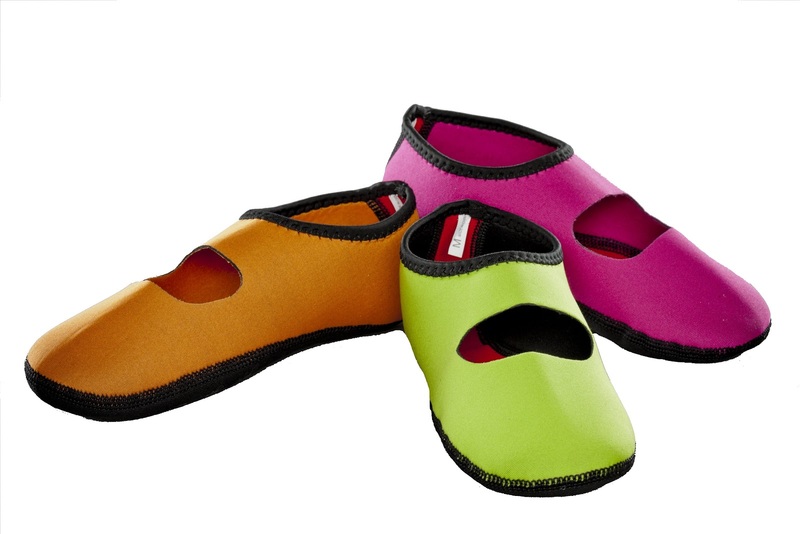 Nufoot footwear comes in multiple sizes and colors for men and women. This exercise system is perfect for those looking for a low-impact workout with kick! If you already swim, Aquajogger keeps you at shoulder-level deep, and with the belt and flotation components, allows users to mimic movements from walking to full out jogging. This brings your water work out up a notch, but without the joint discomfort. I’m loving this! The ePulse is a continuous heart rate monitor (and pedometer AND calorimeter). Actually, it’s the worlds first STRAPLESS device of it’s kind. Whether you are a walker, jogger or runner, the ePulse 2 helps you monitor your heart rate, keeping you in your target heart rate. The device also counts steps, tracks calories burned and keeps time. Even better? the ePulse 2 is powered by rechargeable battery! Are you looking to start an exercise training program, but not sure where to start? The TRAINERmat is perfect for guiding users of all levels in effective home workouts. When rolled out, the TRAINERmat has 24 exercise graphics shown printed on the mat. Users can work through the different exercises, customizing their workouts. It’s like a workout mat and personal trainer in one! TRAINERroller is another great exercise component that is great for beginners and advanced exercisers alike. It is a roller that is designed to work the entire body. Just like the TRAINERmat, the exercises are printed on the roller and perfect for at home (or at office!) workouts. There are 12 exercises detailed on the TRAINERroller. The roller is made of high-density foam which is meant to massage the muscle and connective tissue as you work out. What are your suggestions for health and fitness gifts? Leave a comment – we’d love to hear from you!